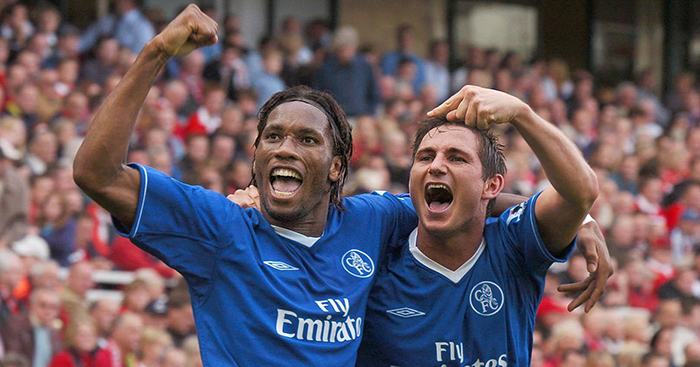 On August 17, 2003, Chelsea played their first Premier League game since being taken over by Roman Abramovich. It was the start of a wonderful era. Plenty of players – and managers – have come and gone since Abramovich took control of the club, but during that period Chelsea have won more trophies than any other English team, with five Premier League titles, six FA Cups, three League Cups, a Champions League and a Europa League trophy added to their cabinet. Chelsea famously beat Liverpool 2-1 to secure Champions League football in the final match before Abramovich buyout, and the opening fixture of the following season was also against the Reds. We’ve looked back at the starting XI that secured another 2-1 win that day at Anfield. 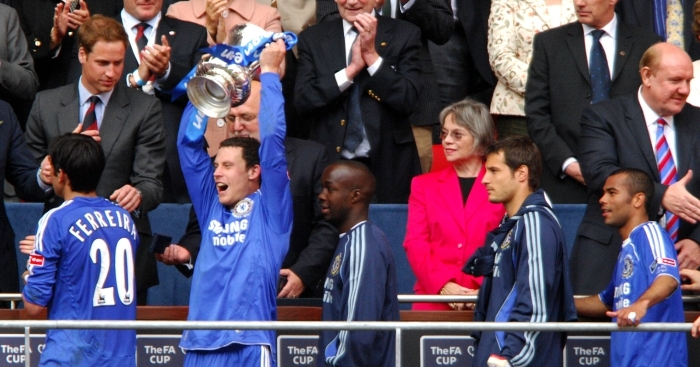 Cudicini had already been with Chelsea for three years before the arrival of Abramovich, establishing a reputation as one of the better goalkeepers in the Premier League. The Italian remained the club’s No.1 (while wearing No.23) throughout 2003-04 before losing his place to Petr Cech the following season. But Cudicini stayed loyal to Chelsea until 2009 when he joined Tottenham. He returned Stamford Bridge as a club ambassador and assistant to Antonio Conte in 2016, with his role seeing him act as a ‘go-between’ to ease tensions between Conte and the board. Despite Conte’s sacking, Cudicini has remained in both positions. Johnson was one of Chelsea’s debutants in Abramovich’s first match in charge, having been signed in a £6million deal from West Ham in what was the first transfer to be completed under the Russian. The former England international never truly established himself at Stamford Bridge and was loaned out to Portsmouth after two seasons before joining them permanently, but some 14 years on from his Chelsea debut he was being linked with a move to Barcelona while playing for Stoke. The move never materialised, of course, and Johnson officially announced his retirement in January 2019 having been released by the relegated Potters at the end of the 2017-18 season. The last surviving player of the pre-Abramovich era, Terry eventually left Chelsea for Aston Villa at the end of 2016-17 having just lifted the fifth Premier League title of an outstanding 19-year-old career at Stamford Bridge. He was unable to help Villa back into the Premier League, suffering defeat in the play-off final against Fulham in 2018, but he returned to the club later that year as assistant manager to Dean Smith having announced his retirement as a player. A goalscorer in that crucial final-day victory over Liverpool the previous season, 2003-04 would prove to be Desailly’s final campaign in a Chelsea shirt. A legend of the game, Desailly now devotes his time to punditry and charity work. We spoke to him ourselves in 2018, with the World Cup winner confessing he does not particularly miss life as a player. Another Chelsea debutant on that day, Bridge had been signed from Southampton for £7million. His best moment in a Blues shirt would come later that season as he knocked Arsenal’s Invincibles out of the Champions League quarter-finals with the winning goal at Highbury. Bridge was never really fancied by Jose Mourinho and went on to join Manchester City, but the former England left-back told us he didn’t really appreciate his quality and thought the Citizens had paid too much for him. He retired in 2014 after a season at Reading. Scorer of the winner against Liverpool on the final day of the previous season, Gronkjaer began the new campaign by providing the assist for the opener at Anfield. The Dane went on to spend short spells at Birmingham, Atletico Madrid and Stuttgart before settling at FC Copenhagen. He retired from top-level footballer in 2011 but returned five years later to play for FC Graesrodderne (FC Grassroots), a Danish seventh-tier team set up in 2015 for former professional players who missed the game. The arrival of Jose Mourinho prompted the departure of many of the players who helped establish Chelsea in the top four of the Premier League, but the Portuguese kept Geremi around for three years, describing the versatile Cameroonian as “an important person and somebody we love very much” when he eventually left for Newcastle in 2007. He finished his career with AEL in Greece in 2011 and was elected president of the Cameroon players’ union five years later. Neither Manchester United nor Chelsea ever really saw the best of Veron on a consistent basis, but he did smash home the opener at Anfield. Once Mourinho took over at Stamford Bridge the midfielder was immediately loaned out to Inter Milan. He briefly came out of retirement for a fifth spell at Estudiantes at the age of 42 in 2016 and is now the Argentinian club’s chairman. Ranking alongside Terry as the lifeblood to Chelsea’s sustained success under Abramovich, the midfielder became an icon at the club before moving on in 2014. After retiring in 2017, Lampard established himself as one of the most articulate pundits on television before being appointed Derby County manager in the summer of 2018. The final debutant who start for Chelsea in the first match under Abramovich, Duff was the most expensive signing during the Russian’s first summer, costing £17million from Blackburn. Duff would go on to play the best football of his career under Mourinho before an unhappy spell at Newcastle was followed by a return to form at Fulham. His playing career ended with a spell at Shamrock Rovers, where he began his coaching career. He also had a role in the Republic of Ireland youth set-up, and in January 2019 he took over as Celtic’s reserve manager. Another player to earn the trust of Mourinho, and arguably one of the most underrated forwards in Premier League history. He joined Barcelona in 2006 before going on to play for another 11 clubs in a nomadic end to his career, eventually hanging up his boots after 22 years in 2016 following a brief spell at Molde. Did they sell him too soon? The striker came off the bench to score the winner at Anfield but left Stamford Bridge once Mourinho took over. He has gone on to manage Royal Antwerp, Burton Albion, QPR and Northampton Town. One of the few players to turn out for Chelsea, Arsenal and Spurs before finishing his career with Perth Glory. Came off the bench to make his Chelsea debut at Anfield and, like Duff, played the best football of his career under Mourinho. His career in England petered out and he eventually retired in November 2018 after a spell with Tampa Bay Rowdies in the United Soccer League. He’s now back at Chelsea in a coaching role.